Supply and Trading is one of the core business units within an International Oil Company (IOC). The business operates a large global estate of over 2,400 servers and thousands of databases, with 24x7 energy trading of gas and oil products out of the ground and in transit around the world. The IOC’s challenge was to save costs without impacting critical trading and compliance systems. To do this they evaluated a number of suppliers with expertise in the area of IT infrastructure capacity management, and selected Capacitas to identify cost savings. Capacitas ran a pilot with business units and IT teams which identified significant cost reduction opportunities and which subsequently led to the broader adoption of capacity management across the organisation. The programme of work delivered reductions in cost of millions of dollars, as well as a saving of over $10m in the avoidance of downtime to services. Capacitas ran a pilot to understand how to collect data on services and analyse the current usage of assets at the IOC. A large, representative service – the Credit Risk Service - was chosen for the pilot. This service produces a key business outcome each day showing the overall dealer position of the Supply and Trading division. The service is critical to maintaining market compliance and hence the ability to trade. Through document analysis and workshops Capacitas developed a map of the end to end service to identify all its components and to understand the relationship between the applications and infrastructure. We then gathered data from the infrastructure, databases and applications to construct a sophisticated service model which identified opportunities for server consolidation. Cost savings were calculated and areas of risk identified. Identified a whole server environment that had not been used for three years, and which cost $230k per year over that period. Capacitas ensured the removal of this service, thereby reducing operational expenditure. 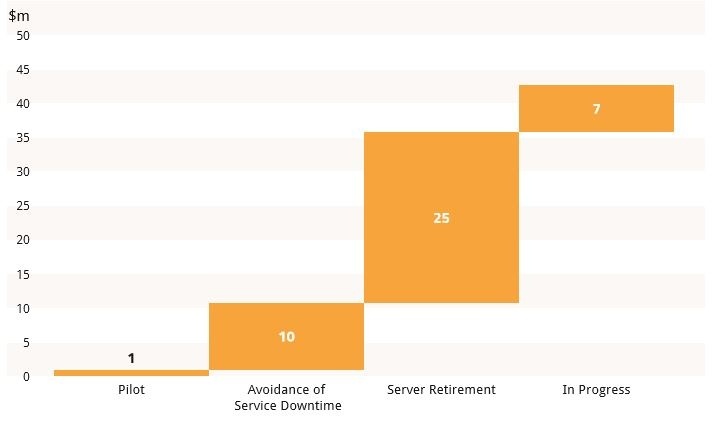 Identified that the relocation of one particular application would free up 37 servers that, when decommissioned, would save over $500k per year. Identified and corrected issues with over 500 servers which were not being monitored, leading to improved service availability. Identified consolidation opportunities with Citrix servers to the value of $150k. Over the last two years since Capacitas has been engaged, the IOC has retired 1,000 servers, realising savings of $25m per year. IST has now targeted a further reduction of 25% of the remaining server estate and CMIS will play a central role in identifying and verifying the targets for removal. A 25% reduction in the estate will deliver a further $7m in additional cost reduction.